8 Scrumptious Asian Delicacies That You Must Try! Asia is such a vast area and hence the food items are also of various flavors and types. The food is influenced with different cultures, flavors and lots of spices. Many of Asian recipes are popular amongst westerners. Let us have look at the most popular and widely admired delicacies of Asia. Fish balls: These are made from pressed fish meat and are cooked, fried or steamed. They are eaten on a stick or as soup. They are small, cheap and known as poor man’s dish. Fish balls are very popular in Asia and are considered as delicacy. Fish balls are eaten on their own or marinated or dipped in sauce. They are also mixed with kway teow noodles, rice or tofu. They can be spiced up by adding garlic, vinegar, spring onions or soy sauce. You can get all these ingredients in an Asian food store . 2.Laksa: This is a spicy noodle soup that is invented by Singaporeans. However, it seems like it was derived from Malay or Chinese culture. It is widely popular in Malaysia, Singapore and Australia. It contains combination of coconut, lemon grass, thick noodles, egg, tofu, fish sticks, shrimps and bean sprouts. Hainanese chicken rice: This is a effortless, simple and uncomplicated dish that is famous in Malaysia, Thailand, Singapore and China. It is mostly boiled chicken served with white rice and complementary items like cucumber, lettuce and eggs. Hainanese Chicken Rice is one of the lesser spicy Asian dishes. It can come with a clear chicken soup or broth. Sometimes they are served with dips consisting of chopped chili, soy sauce and ginger. 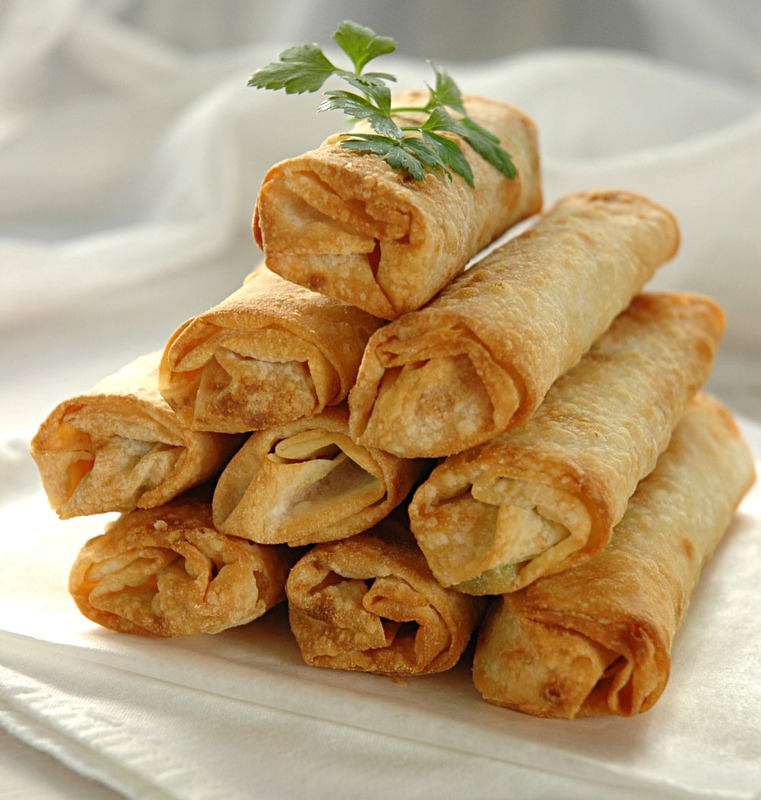 Spring Rolls: These are popular in most Asian countries and widely liked all over the world. These are mainly fried rolls that are filled with all kinds of ingredients like raw or cooked meats or vegetables. There are versions which are not fried and mainly eaten in Taiwan. The most popular ingredients are minced pork, cabbage, carrot, bean sprouts, sauces, fresh garlic chives, cooked rice, vermicelli noodles and mushrooms. Spicing ingredients like Soy sauce, peanut powder or fish sauce are sometimes added. Depending on the country, spring rolls are served raw, steamed, boiled or fried. Fried rice: It is cooked white rice with coconut sauce and saffron. It can be eaten with meat or vegetables. This is widely famous and comes at cheap price. You can add eggs, prawns, satay and vegetables to make it a wholesome meal. As rice is staple food of Asia, you can get various varieties of rice. You can also fry the cooked rice with soya sauce, garlic, chilies to make it spicy. Tom yum: This is a watery preparation that is eaten with or without rice. It has strong flavors of tamarind, lime and lemon grass. Different sea foods like prawns, fish can be added. It was originated in Thailand, but now popular all over the world. Sushi: Sushi is a popular item all over the world. It is mostly available in high class restaurants. It contains raw fish, vinegared rice and soy sauce wrapped in sea weed wrappers. It can be served with ginger, pepper, soy sauce or wasabi. Surely your mouth must be watering after reading about these Asian delicacies. Well, why wait? Go ahead and try them! Author bio: Daniel loves to cook and try new cuisines. He regularly goes to Asian food store and buys various Asian food items. In the above post, he is telling about the most liked Asian food.